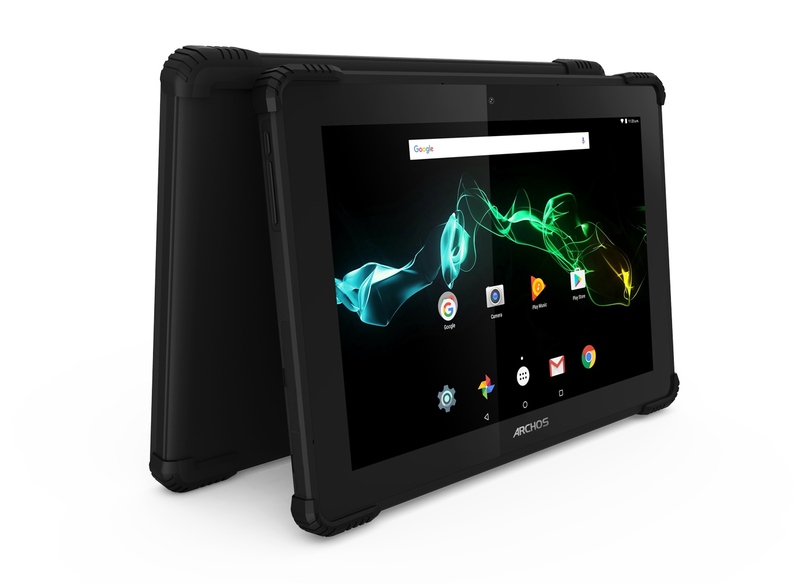 Just before the MWC 2017, Archos unveiled its latest rugged tablet called Archos 101 Saphir. Last year, the company also launched the 50 Saphir rugged smartphone with a 5-inch. The company mentioned to start shipping the 101 Saphir tablet only from June, and the complete details along with the pricing will be announced at the MWC in the next few days. From the images, we can see the rubber bumpers on the all the four corners than can protect the Archos 101 Saphir from drops. There are thick bezels on all the four edges of the display. Apart from the rugged features, the tablet comes with basic specifications. It sports a 10.1-inch IPS display with a 1280 x 800 pixels resolution. Under the hood is the MediaTek MT8163 quad-core processor clocked at 1.3GHz and coupled with Mali-T720 MP2 GPU. It also packs just 1GB of RAM which will be good enough for basic usage. The tablet includes 16GB of internal storage which can be further increased with the MicroSD card slot. The tablet runs on the latest Android 7.0 Nougat out of the box with stock Android UI. In the camera department, the 101 Saphir features a 5MP rear camera and a 2MP front camera mainly for the video calls more than the selfies. With IP68 certification, the device is also water, dust, and drop resistant. Archos is also providing a keyboard accessory to make this rugged tablet into a 2-in-1. The 101 Saphir is backed by a 6,000mAh battery that can easily give a day long battery life with these basic specifications. It supports fast charging the 5V/2A power adapter provided within the package. It measures 265.4 x 181 x 13.4 mm and weighs almost 600 grams. Connectivity options include Wi-Fi, Bluetooth 4.0, GPS, A-GPS, and a USB Type-C port.The earlier launched Archos 50 Saphir came with a 5-inch HD display protected by Gorilla Glass 4 on top. The device came with 2GB of RAM and 16GB of internal storage. It sports a 13MP rear camera and a 5MP front camera. At that time of launch, the 50 Saphir was introduced with Android 6.0 Marshmallow out of the box. The 5-inch Archos 50 Saphir is backed by a 5,000mAh non-removable battery that is rated to deliver up to 37 hours of talk time.